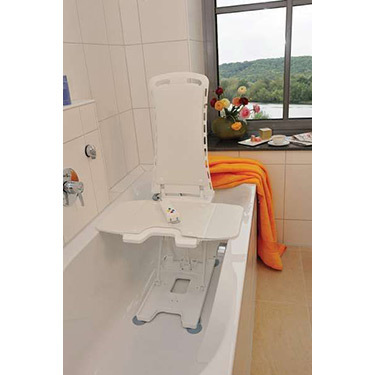 This model comes with white vinyl seat and backrest covers, and includes a three-year guarantee on the battery/handset. The blue comfort cover is NOT included with this product and can be ordered separately here. Pros:The flaps are sturdy enough to sit across. The unit goes down slowly enough. Somewhat easy to assemble. This product allowed my mother to enjoy taking a bath once again. It has been wonderful so far. Really made my day to see how happy my 88 year old mother was to be able to soak in the tub again.